Endless Summer is one of the most spectacular Spring Farm villas. 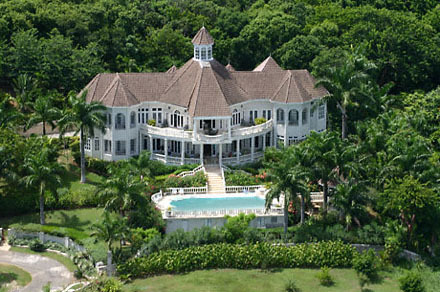 Located above the Half Moon Bay golf course, with spectacular views of the Caribbean Sea and the Jamaican north coast, Endless Summer is one of the most popular and desired villas in the Montego Bay area for weddings and other elegant occasions. From its two-story living room and expansive public spaces to its sweeping terraces, Endless Summer provides a perfect setting for elegant parties or just your private enjoyment. Weddings or other large functions require a one week minimum rental at the full 7-bedroom rate. The villa has air conditioned bedrooms and gym for your comfort, however, the constant breezes will tempt you to forgo this feature and enjoy the fresh air and wonderful Jamaican climate. Steps from the veranda lead to a beautiful 40' by 20' swimming pool with spacious deck and views of the blue Caribbean. Your professional staff will attend to your comfort and insure that your villa vacation will be an unforgettable experience. Enjoy a variety of setting in which to enjoy meals prepared expressly to your tastes: the formal dining room, the casual breakfast room, veranda all offer their own special ambience for dining. For your enjoyment, the villa is equipped with cable TVs, VCR and 10-speaker stereo system with CD player. Enjoy music by the pool, on the veranda or within the public spaces of the house. A recent addition is a 75" Samsung flat screen television with sound bar and Apple TV that gives you access to the best 1080p HD content including blockbuster movies, hit TV shows, Netflix, live sports, your music, photos, videos and more right on the wide screen TV. The villa has a membership at the nearby exclusive Half Moon Resort, including beach, gym, pool and tennis (does not include golf). Golfers will find some of the finest golf courses in Jamaica within minutes of the front door: The Half Moon Resort course with its world-famous 18th hole, the recently redesigned Rose Hall Cinnamon Hill, and the spectacular new Ritz-Carlton White Witch. Main house bedrooms all have views of the Caribbean Sea. -Master Bedroom On the upper level with its 4-poster king-size bed, balcony, seating areas, and bathroom with Jacuzzi and walk-in shower, make an ideal honeymoon suite. -Bedroom 2 Queen-size bed and is located on the lower level of the villa and has its own private seating area and porch. -Bedrooms 3 Queen-size bed and balcony, located on the upper level in a separate wing from the master bedroom. -Bedroom 4 Queen-size bed and balcony, located on the upper level in a separate wing from the master bedroom. These two bedrooms are located in a separate annex on the upper level above the garage and have their own separate entrance. These rooms may also be reached from the main house Master Bedroom suite. Both bedrooms are ideal for children or single guests. -Bedrooms 5 Has two double beds and private bath. -Bedrooms 6 Has two twin beds and private bath. -Bedroom 7 Cottage Bedroom Has two queen beds and private bath, indoor and outdoor sitting area. 9 Cable televisions, audio system with DVD player including a new 75 inch TV.